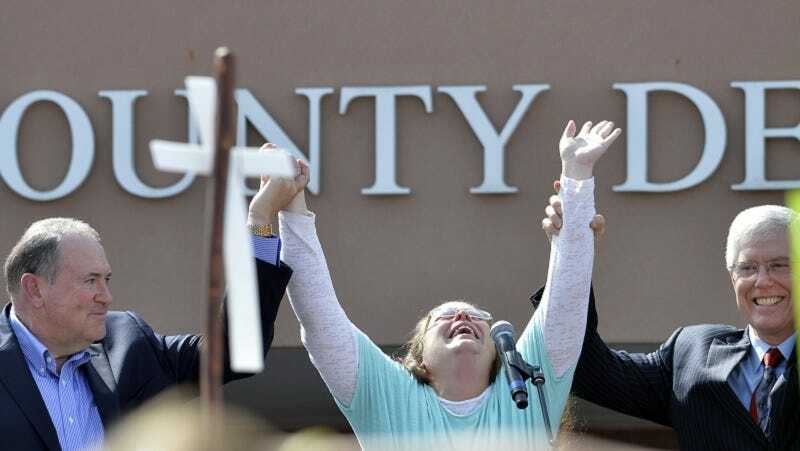 Kim Davis, the Kentucky clerk who refuses to issue marriage licenses to gay couples, was released from jail Tuesday morning. To celebrate her release after six hard days in prison, Davis did what any casual bigot would do: she held a press conference with Mike Huckabee. At that press conference Davis cried and waved to the crowds, the crowds waved cardboard crosses, her husband wore overalls, and the Survivor tune Eye of the Tiger played in the background. But Survivor is risin’ up and back on the streets to let everyone know that they didn’t give Davis permission to use the song. “NO! We did not grant Kim Davis any rights to use ‘My Tune -The Eye Of The Tiger,’” the band wrote on its Facebook page. “I would not grant her the rights to use Charmin! C’mom Mike, you are not The Donald but you can do better than that -See Ya really SoooooooonnnnnnN!!!!! !,” they added. Perhaps it’s not surprising that Davis would be attracted to the song. It was originally featured in a classic film that really delves into the complexities of the relationship between individualism, religious exceptionalism, and the law: Rocky III. I’m assuming that Davis is Sylvester Stallone in this scenario and not Mr. T.